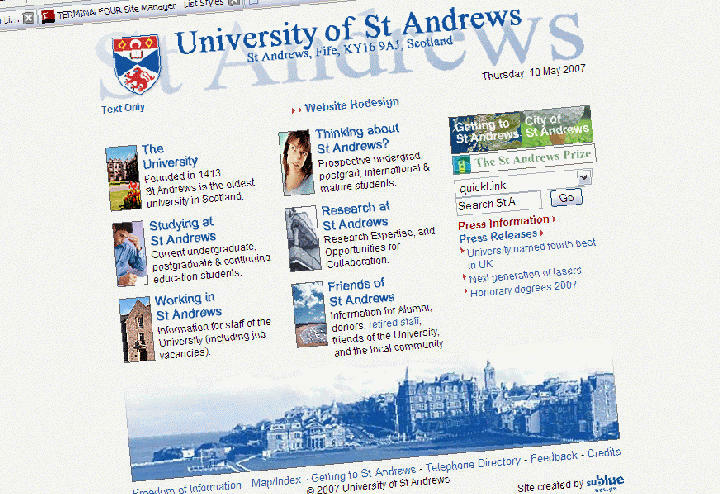 Today is exactly ten years since I started working at the University of St Andrews. I joined the web team within Business Improvements as assistant information architect/web manager. There were two of us in the team. I always said at the time that I liked my job title because with the forward-slash it looked like a URL. I remember getting offered the post and thinking, “Well, if I don’t know it now I can always learn it on the job.” You read my reflections on the job interview here on my blog. Ten years on I am now the web architect within the digital communications team (part of Corporate Communications) we have a team of 10, and I work mostly in Agile project management and business analysis. Ten years on, I still love my job, and I love my team. I’m still being challenged, I am still learning how to do my job better, and I still growing. Obviously, I’m now even more involved in the life of the University having taken up the post as warden at Agnes Blackadder Hall. I will reflect on that in more detail in another post shortly, suffice to say here that I’ve agreed to stay on beyond my probationary period. But today I’m celebrating ten years here… well, fourteen if you include my four undergraduate years from 1989 to 1993. I wonder where I will be in ten years from now. Why don’t they use question marks for the two big questions on the St Andrews page you linked to? Especially the ‘Why St Andrews’ button sticks out like sore thumb. The other ‘What’s happening in St Andrews’ is less obtrusive but still missing a ? For a higher educational institution of that ilk it does not inspire. I am sure I was reading your blog 10years ago. I suspect I still will be in another 10. Infact, I hope I am. They don’t use question marks because they are not questions. Hi Chris, but are those actually questions? Try reading them as statements.